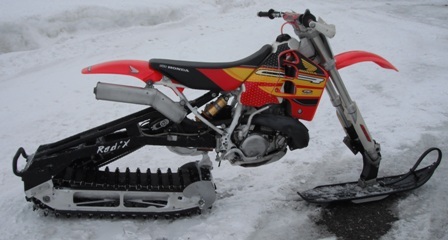 I’m sure you've heard of conversion kits that transform dirt bikes into snow machines. The 2Moto Radix Snowbike Conversion stands out in that it is not a cobbled together playground toy built in a homemade shed with "eyeball" precision. This kit is a well-designed, well-engineered and well put together piece of equipment. I was quite skeptical upong first hearing about the 2Moto kit and had enough questions to win a game of Jeopardy, “Won’t the thing sink in the powder?” “Is the kit hard on your clutch?” “$4000 BUCKS!!!?? ?” I am an avid snowmobile rider and I was not ready to give up my 150+ inch tracks and high output twin engines. But after parting from my stubborn ways and giving this conversion kit a try, I’m sold. The 2Moto is everything it's cracked up to be. I mentioned earlier I was raised on snowmobiles. I have been riding since I was 6 years old and have done everything from race snow cross to climbing the steep and deep on mountain mods. Needless to say I like snow and I got used to throwing myself around on these big sleds. But this kit takes your riding fun to a whole new level of fun. If you want to sidehill on a sled a lot of things have to happen right: you must get off the seat, dig your feet into the rails, pin it and pull as hard as you can; and to keep the sled on the side you gotta hold that throttle open and keep the track dug in. Sleds are wide and don’t like to lean. But if you want to sidehill on the 2Mo to all you do is point and shoot. If you compare a sled and a bike just about every task for the bike follows the same simplified set of instructions: point and shoot. If you want to take a 40 mph turn on a sled, under a 20-foot radius, you're asking for trouble. But, if you want to do it on you bike just lean the bike over till you feel you knee digging into the powder, and ride it out. No problem. The 2Moto/CR500 in action, more action. Our long-term satisfaction with the 2Moto is very high. A bonus is that it is very well-supported by the manufacturer. We purchased our kit used (about a year old) and we've used it an entire winter. We rode nearly every weekend hitting the powder, slush, frozen crust and everything between. Our 2Moto has been ridden very hard and put away very wet! After all of this abuse we have had but one problem: after bottoming out on a massive cornice drop we broke the knuckle that attaches the top of the shock to the frame. We contacted 2moto and had a new one, free of charge (and shipping) in two days. No questions asked. “We stand behind our product so you don’t have to,” said one of the 2moto reps. That's the kind of thing that helps ease that sticker shock and make riding even more fun.